This conversation is between Blacklanderz Lorinda and her husband Bruce. Lorinda has read the books; Bruce has not. Edited by Vida. Last week in Epi2, we were introduce to some of the key characters that will play major roles in S3 of Outlander. 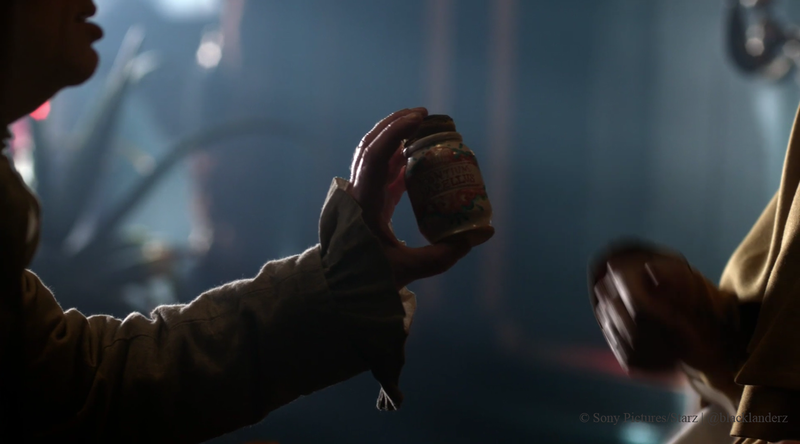 This episode also introduces some other key characters and we get to see the useful occupations of Jamie, Claire and Wee Fergus. 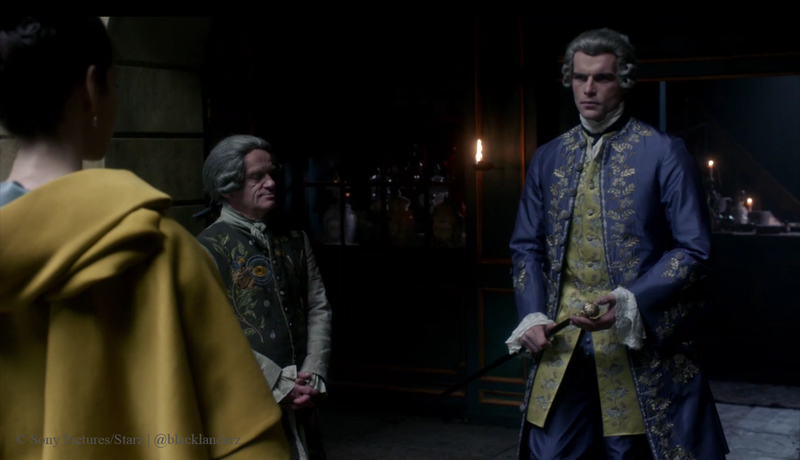 The deception comes into play on three sides, Jamie with the Bonnie Prince Charlie and the other Jacobite’s, Claire and Murtagh in relationship to Jamie and the fact that Black Jack Randall is still alive and deceptive little Fergus pick pocketing everyone. Also of note, the opulence is still in abundance and the costumes and set designs are simply stunning. 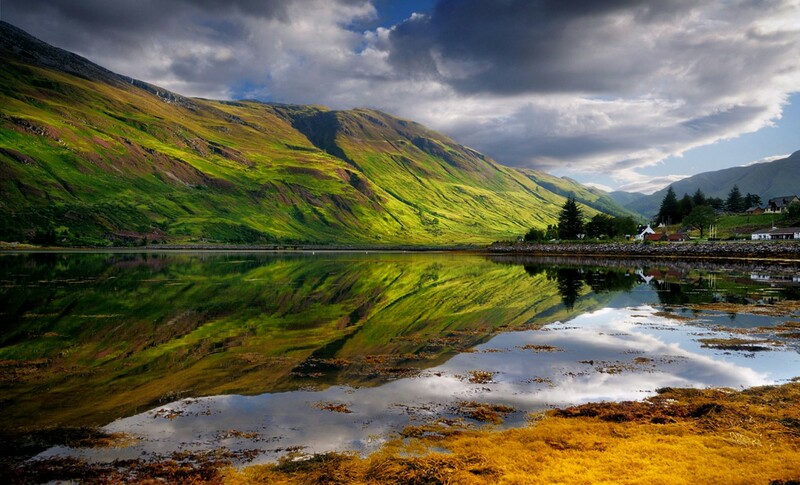 Lorinda: This episode was meaty; it opens with Jamie coming home at sun up, Claire eagerly going to meet him and to receive a report on what he has learned. I was shocked to see Jamie come home change his clothes and head back out. Bruce: I liked this episode too. Jamie is clean; I would wear that vest. He is just getting home and leaving again. Where is he going? You know I really like Jamie, he is a man’s man. He operates with integrity and he is very intelligent. 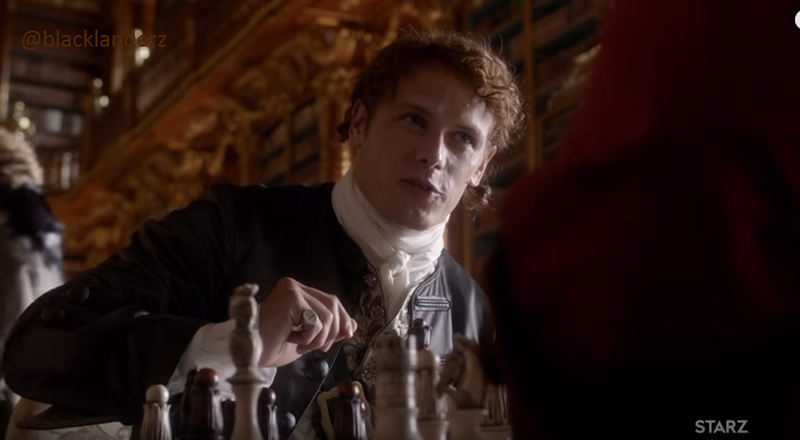 Anybody that can play chess like that, make the decisions he has to make and stay in contact with that weird man, what’s his name Bonnie Prince Charlie. Yeah, he’s cool; I respect Jamie. L: Claire is frustrated Jamie keeps trying to push her into the sitting pretty little wife, but that is not her. 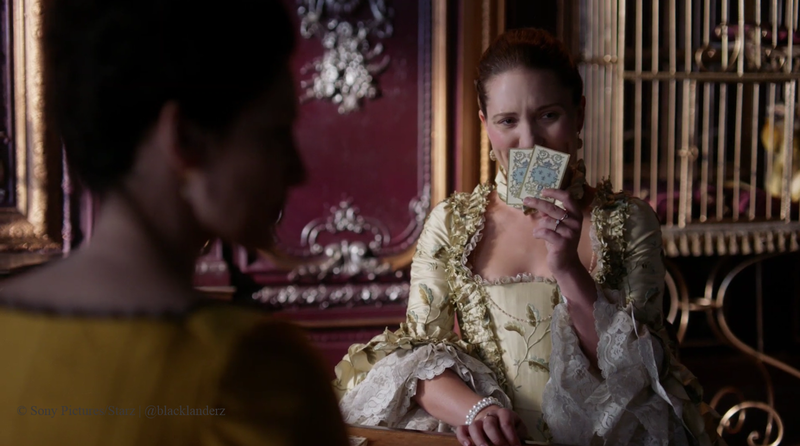 Claire needs an occupation, something to do, just like Jamie. She goes on with the plan and has tea with Louise and Mary. Poor, Mary Hawkins; she is so naïve and sheltered, why doesn’t she believe men do that to women? Yes, Claire needs to have a little talk with her. B: Why is she speaking like that? She stutters . . . oh ok. She is very naïve. What, is she a virgin? Louise, I love her. I would be laughing at Mary too talking about gentlemen don’t stick their hmmgm . . . yeah that. L: That look on Claire’s face when she realizes where she’s heard Mary’s name and what the relationship to Frank is. What is she going to do? Black Jack is alive and now she can’t tell Jamie. If she does tell him, Jamie will find him and kill him, and no more Frank. B: OMG! So she’s Frank’s grandmother, oh 7th great grandmother. Well now, how is that? Isn’t BJR dead? Oh forgot, he isn’t . . . uh-oh. L: Claire is fit to be tied. But, she’s not upset about that scarf. She is upset about her revelation about Mary. 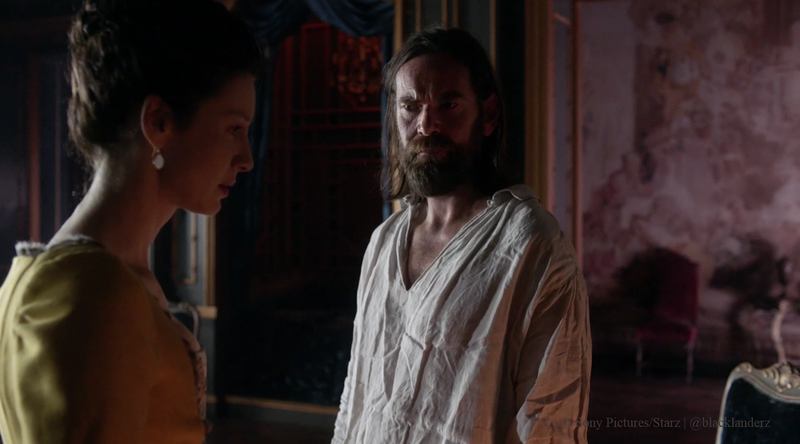 Suzette is getting busy with someone; oh, it is Murtagh. I guess he had to find something to do with his time since he’s not raiding coos in Scotland anymore. 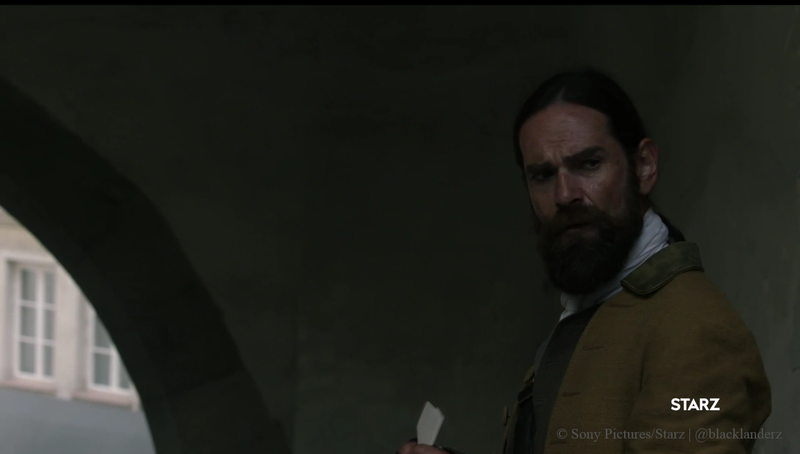 B: Murtagh was getting him some (*wink*). I really like him! I would like to have him on my side; he’s direct and so funny. 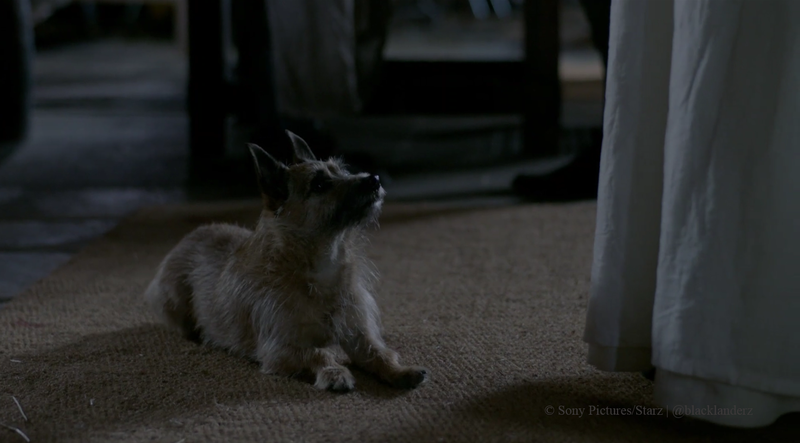 He’s very loyal to Jamie and to Claire. 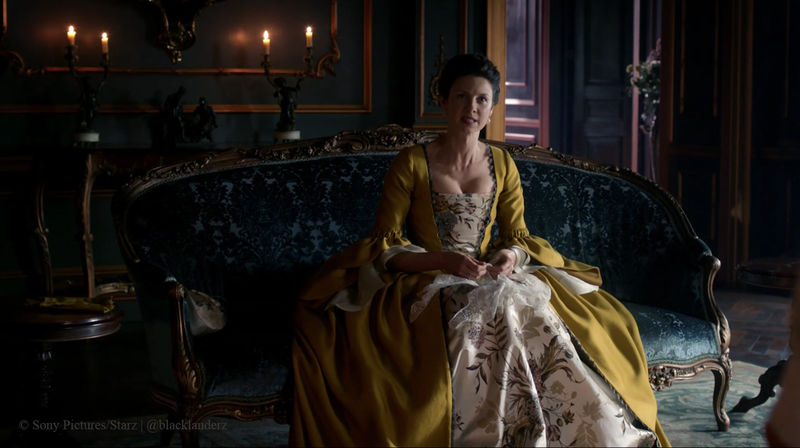 L: She’s frustrated and is going off on Murtagh; but she backtracks and tells him her secret that BJR is alive. 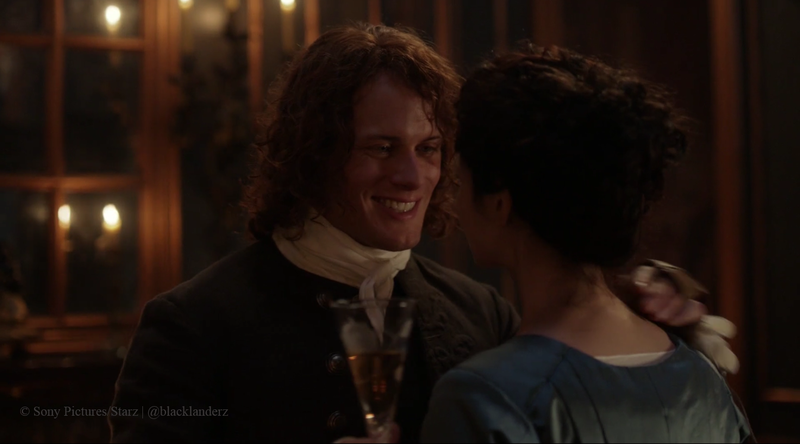 Glad, he agrees with her to keep it from Jamie to keep him alive. B: I agree that they should keep it from Jamie, BJR damaged him. If I were Jamie and I found out he was alive, I’d find him and make sure I killed him myself. I think Jamie is gonna kill him when he finds out. 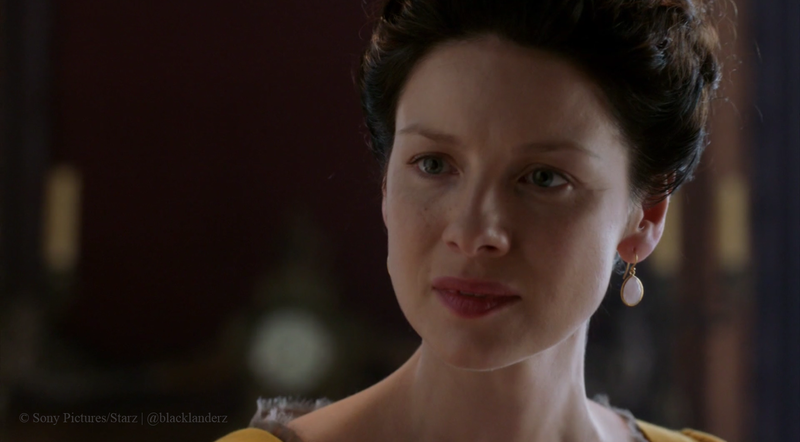 B: Claire is very considerate getting that birth control for her maid. Wait! They had birth control back then? Hmmm . 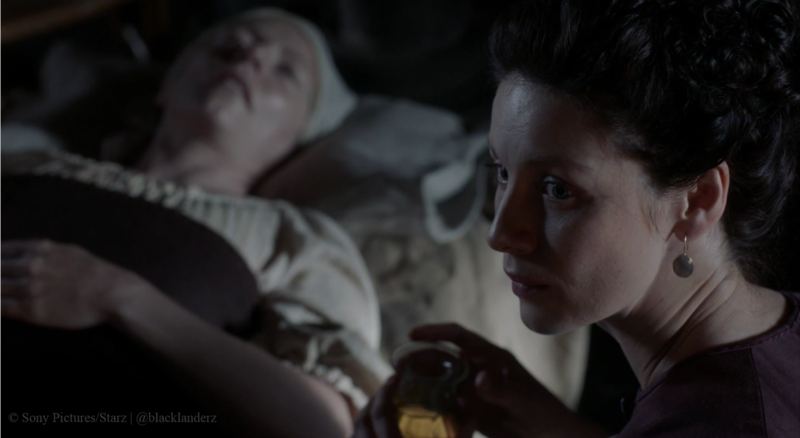 . . Claire is very resourceful. B: Who is that Jamie is playing chess with? So, he’s a financier? Jamie is working it, isn’t he? He is making arrangements so that Duverney, Minister of France, can meet him and with the Bonnie Prince at the brothel. Pretty smooth! 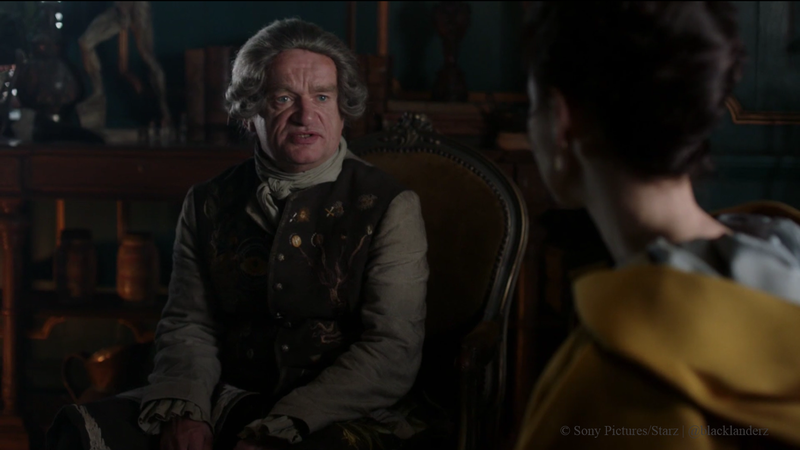 L: Yes, he’s the financier Jamie is trying to dissuade from giving funds to Bonnie Prince Charlie’s ridiculous attempt at a war. Jamie is quick on his feet when it comes to problem-solving in tight situation. However, what Jamie did not account for was that the Prince has secret plans of his own. He revealed to Jamie and Duverney that he had already secured £40,000 and that he was in secret negotiations with several highly and influential British aristocrats. Go ahead and say it . 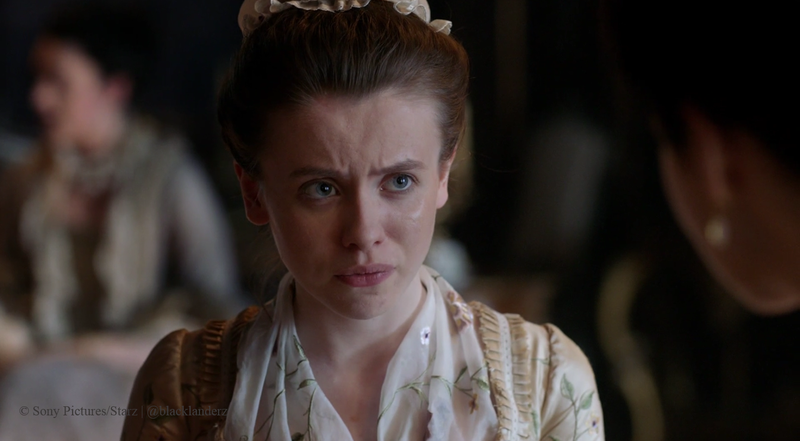 . .
L: I like Master Raymond, but wonder why he calls Claire Madonna? Whoa, he is calling her out and he knows she doesn’t want to be anywhere near the Comte St. Germaine. However, what Master Raymond did not discuss was his conversation with Le Comte and the secret they have. The costumes are just exquisite! While she is getting some form of birth control for her maid, she notices the poison in the shop – nice foreshadowing of what is to come. 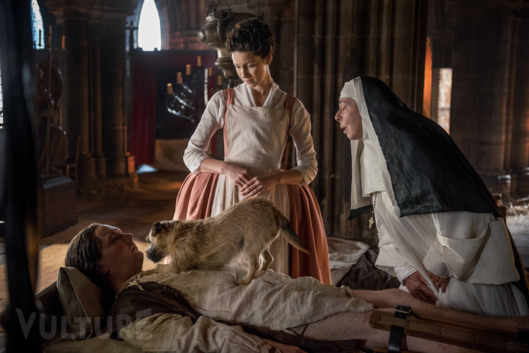 Master Raymond knows Claire has exceptional medical skills. I’m glad he referred her to the charity hospital, L’Hôpital des Anges, where she could be of use. Look at her face light up when he mentions it. L: It was great finally getting see Mother Hildegarde running L’Hôpital and seeing the inside of it! Bouton! He is such a cute little dog. 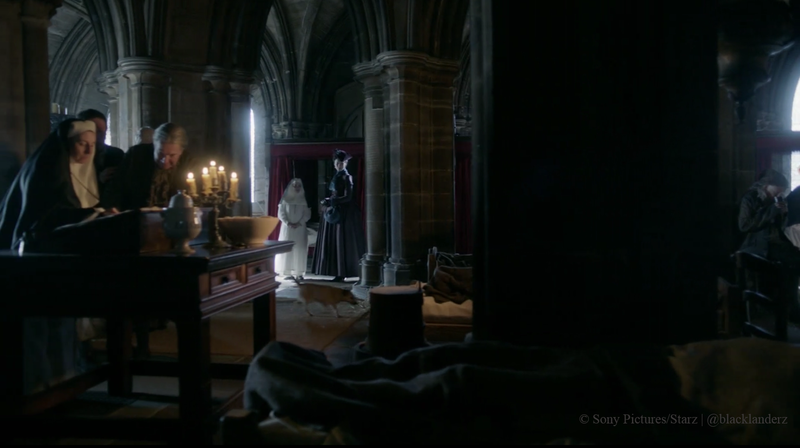 I like how both Mother H and the other nun kind of laughed inside when Claire says she has medical skills. Put her to work and see what happens, uh-huh. She knows a bit more than you thought, now you put her on to some real work instead of dumping peoples excretions. 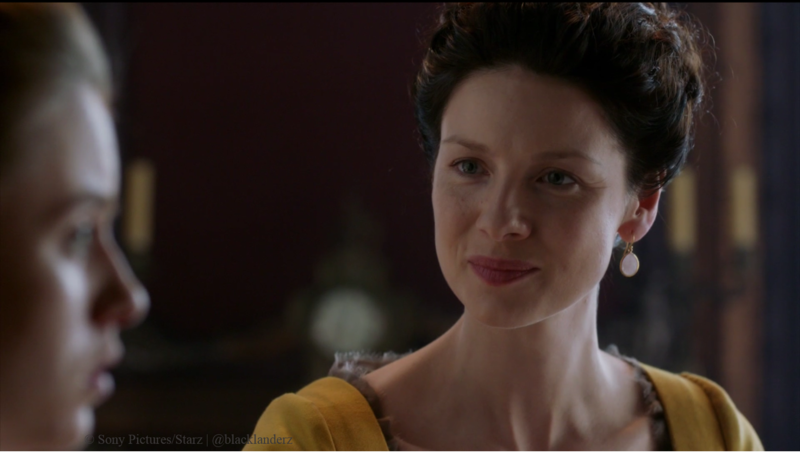 B: Claire is a benefit to the hospital; they are lucky to have her. Why did she just taste that urine? Oh ok, that’s nasty. I guess they know that she really does have medical skills. They’re going to be happy to see her come back. That thing she just pulled out of that man’s leg was nasty, just thinking about it . . . yuck. Bouton is like the medical equivalent to a canine drugs unit today. He has some serious skills the way he sniffed out that infection. 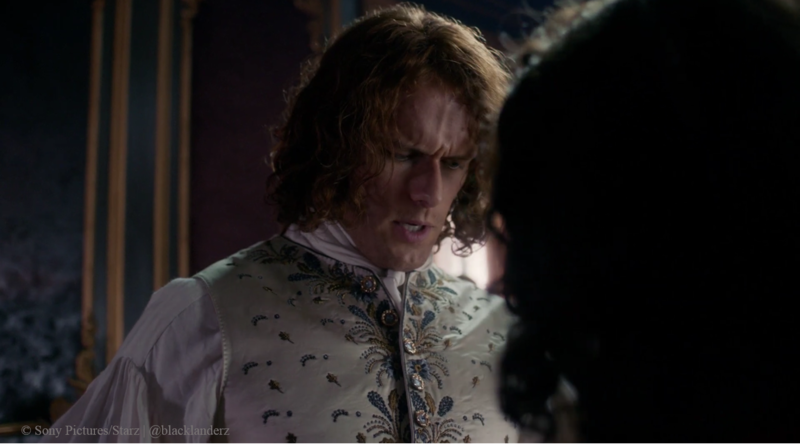 L: Oh Lord, conflict is coming; Jamie is angry. 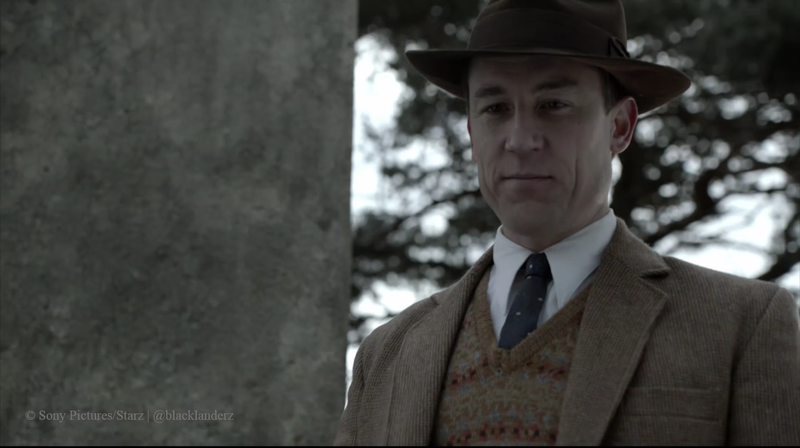 Thought he wouldn’t be too worried since Claire is with Murtagh; thought wrong. So what if she wasn’t home waiting on you, you haven’t been coming home at night. You now see the difference between the era’s in which they were born. Claire believes that everyone should have a useful occupation whether they’re pregnant or not. This is another issue to pull them farther apart, please help them somebody! That didn’t end too well and Jamie is headed back to the brothel, really! 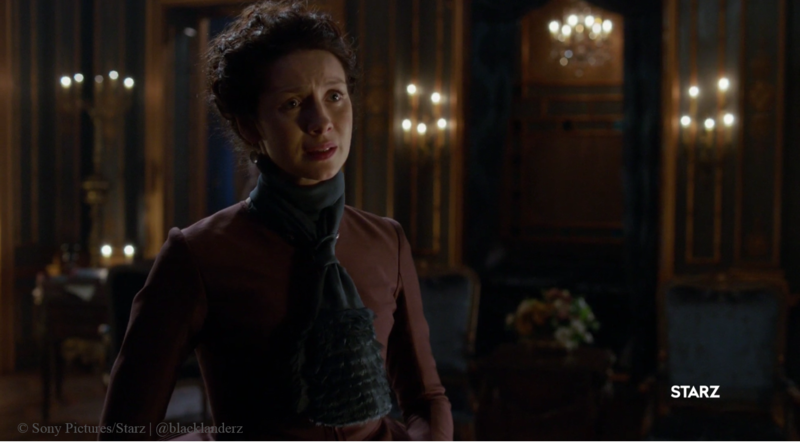 B: I don’t agree with Jamie wanting Claire to stay home; he’s not home. Like, I said before Jamie needs to give her (*some*), so she can relax a little. Oh yeah, he can’t! She needs to be at the hospital working where she can help in a major way. She has knowledge they don’t have in the 18th century. Murtagh knew when to make an entrance. 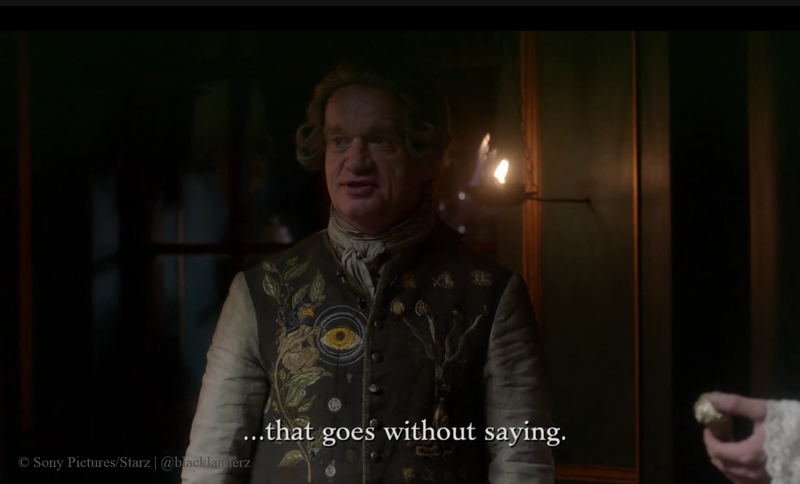 What did Claire’s maid say about the Boudoir? Yep, when love leaves the bed, there is tension in the marriage. B: Why is Jamie at the brothel again and why is he letting that woman hug on him. Yes, that’s the Jamie I know, don’t let her do you like that. Jamie has integrity, see that right there. What is that little boy doing? So Fergus is a pick pocket? He’s good at it too. Jamie’s watching him. 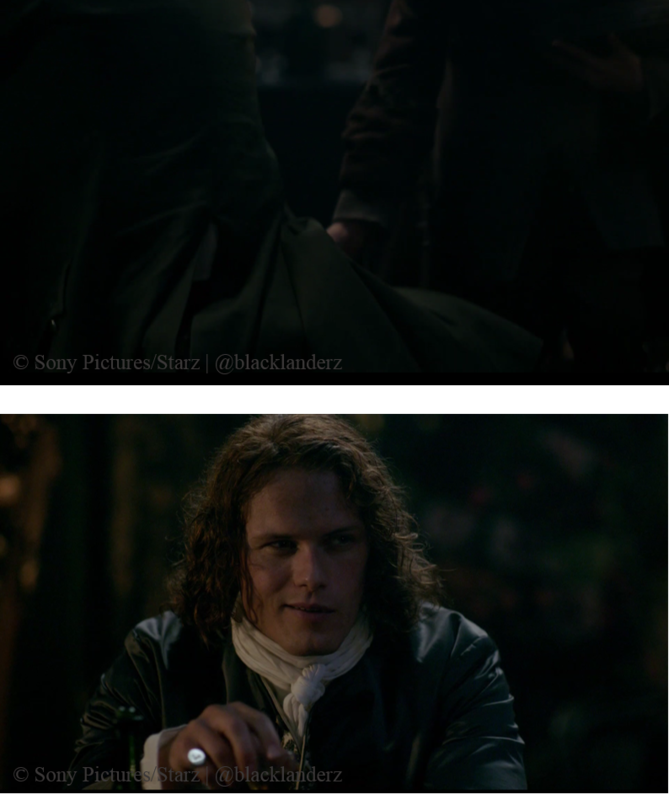 Oh Jamie is smart, he needs Fergus to do what he can’t and it didn’t take him long to find out how to employ him. What did you call him, Wee Fergus? He’s a smart kid. He also has a smart mouth, too smart for his own good. L: Fergus is cute; look at his lashes. Yes, I knew he was a great pick pocket. 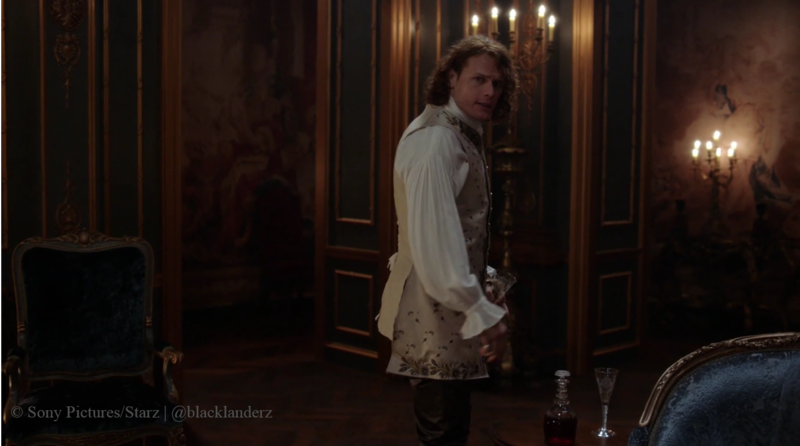 I liked how Jamie ran after him and shook him down. I missed the sausage chase like they had in the book; but, they did a great job in exposing, capturing and employing Wee Fergus. 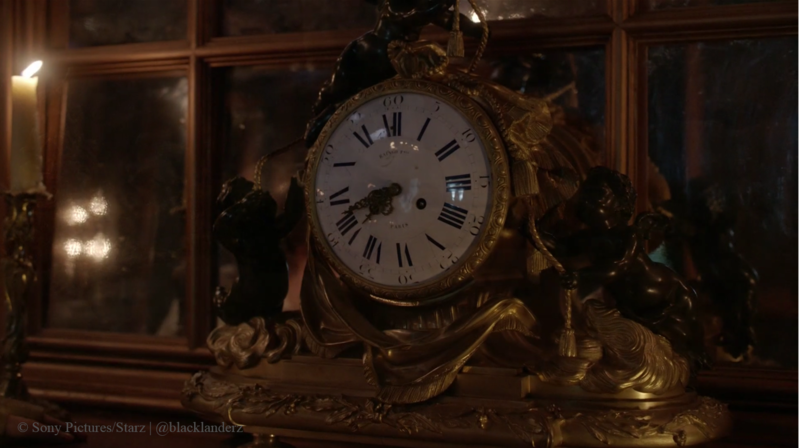 L: Finally at the end, Claire and Jamie come to a common ground once they figured out the letter and that it came from the Duke of Sandringham – playing both sides to the middle! They all have useful occupations – Claire at L’Hôpital; Jamie finally came around to agree to her working there. 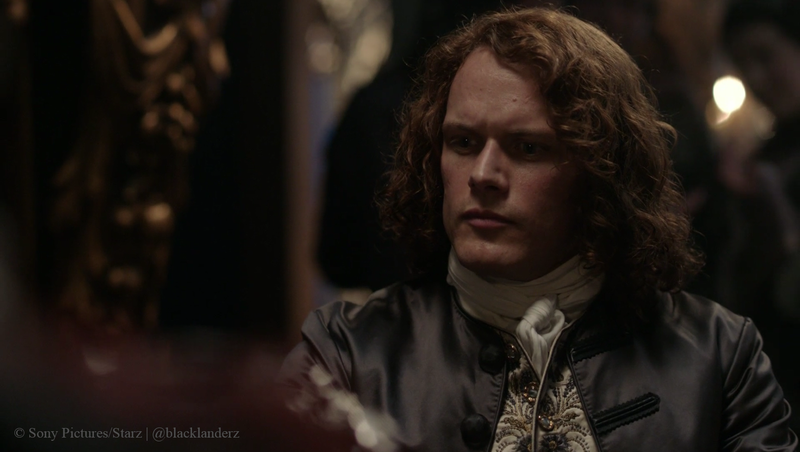 Jamie working by day as a wine merchant, and by night letter decipher and political negotiator with Murtagh and Fergus’s help. Mother Hildegarde even gets in on the act by helping them figure out the music written in the letter. Side note: Jamie looked good coming and asking for help. B: Jamie is smart, didn’t I tell you that. He figured out the letter and, look at him, he’s actually smiling. 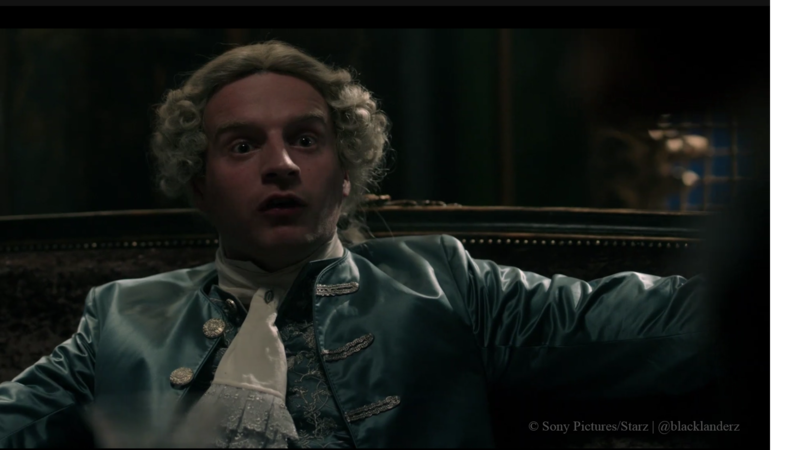 Nope, don’t tell him about BJR; let him savor this moment. Again, it is hard to give this five stars, just being the third episode. But, it is the closest to five than another other episode thus far. With the music, intensity, new characters and character development alone, it deserves this rating. However, we had a lot of extra to add to it. The costumes and set designed were exquisite. The introduction of Mother Hildegarde, Bouton and Fergus were icing on the cake. Fergus was really Fergus with that smart mouth of his. He and Bouton stole the show. But, we cannot forget our favorite godfather, of whom we finally saw another glint of a smile on his face, more screen time and who finally has a love/lust interest with Suzette. We also liked how they covered everything – they provided more insight into sweet, adorable, innocent Mary Hawkins and how she fits into Frank’s family tree. The tension between Claire and Jamie was believable. 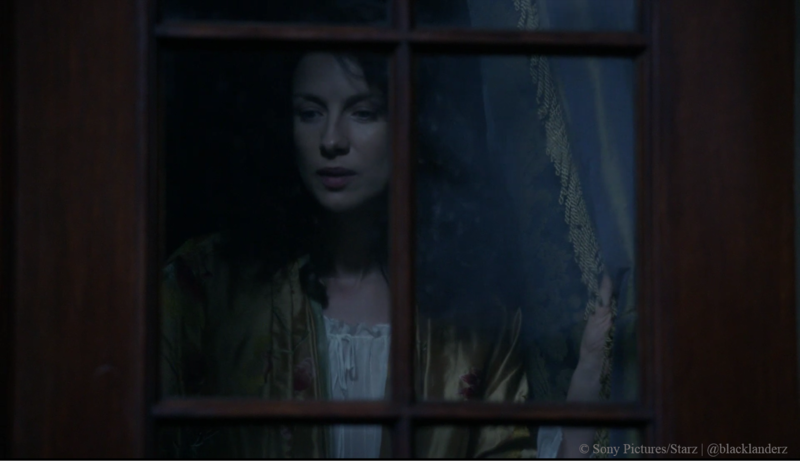 Jamie avoiding her intimately and the frustration it is causing her. It was a very balanced episode in tone and pace with the characters and plot developing quite nicely, a very good adaptation of the book. We can’t wait to see how they make this dinner party work in the next episode. Things start to heat up in the next episode. This a conversation between my husband and me Season two episode 3 of Outlander. It’s excellent! Your husband is hilarious.